ConservativeHome's ToryDiary: Countdown to Brown? Tony Blair (who didn't mention Harriet Harman) only gave a short speech and disappeared off the stage with a video separating his departure and Brown's speech. ...Blair back on after video to embrace Brown. Massive Union Jack on the video screen. 3.15pm: Harriet Harman attacks Cameron as weak and opportunistic - rejects his finger-wagging about the family - his support for marriage and wearing of yellow rubber gloves - Cameron is only interested in women for one thing, she says - their votes. 2.55pm: Blears went out first - Peter Hain next - Surprisingly Benn next - Then Cruddas (who led on first round first preferences) - FINAL PERCENTAGES WERE HARRIET HARMAN WITH 50.3% AND ALAN JOHNSON 49.7%. She won on the back of members' votes - Johnson led on trade unions and parliamentarians. 2.40pm: Both Sky and BBC News 24 are saying that Harriet Harman has been elected. The 2IC of Labour is now an opponent of the Iraq war. On Radio 4's The World This Weekend Nick Robinson has just speculated that Harriet Harman might have been elected Deputy Labour Leader. Only Jon Cruddas has been to the left of the woman who was ejected from her Work & Pensions perch in 1998 after comprehensively failing to master her brief. During the contest Ms Harman has adopted positions on the Iraq war, nuclear power and Trident that are clearly at odds with the Brown-Blair years. The speculation is only that but if confirmed it would bring a smile to Mr Cameron's face. I hope that there will be no Brown honeymoon. I hope that he'll handle his entry into Number Ten as badly as he botched his last Budget. There must be a real danger, however, that he'll enjoy a good couple of weeks - he might even enjoy a few good months. He'll certainly sack some unpopular Cabinet ministers. He'll have lots of attention and will probably announce some popular initiatives. In charge of the Labour machine he'll step up attacks on David Cameron and try to misrepresent results from the policy review process. There's a real possibility that he'll erase our 3.5% average opinion poll advantage and possibly establish a small lead of his own. Labour strategists are desperately hoping that Tory MPs, commentators and, yes, bloggers will over-react to these choppy times. They hope we all might interpret a temporary improvement in Labour fortunes as something more permanent. 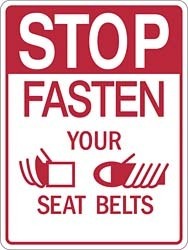 We mustn't over-react. In the mock pledge card below (click to enlarge) I've listed some of the reasons why - if we hold our nerve as a party over the next few months - we can be optimistic in the medium term about our party's prospects. I'm not saying that everything is perfect in Project Cameron (regular readers of this site know that I'd like us to stay truer to our traditional beliefs and to be more serious about issues of social and international justice) but the party has made a lot of progress in the last two years and we must not jeopardise our advances over the summer months. ...I would probably have tried to do some sort of deal with the LibDems. At the moment it's not playing too well for him - with the LibDems accusing him of going behind Ming's back to offer Paddy Ashdown the NI job - but the Brownites may be calculating that, in the medium-term, it will make their man look less partisan and something of a bridge-builder. The fact that Ming had private talks with Brown is certainly good for the Tories and gives us our 'Vote LibDem, Get Brown' campaign for Tory-LibDem marginals. It appears that LibDem MPs in southern seats were most appalled at the prospect of being seen to team up with Labour. Sack Tessa Jowell and Patricia Hewitt. They are the unacceptable faces of Labour sleaze and incompetence. I would also put personal loyalty aside and sack Des Browne, too. I would give big promotions to Miliband and Johnson and Cabinet positions to the likes of James Purnell and Liam Byrne to show that my Government would have a fresh dynamic. I would offer the British people a referendum on the EU Treaty. A new poll from Open Europe says that 83% of Labour voters want a vote. It would also do me a lot of good with The Sun and The Daily Mail. Call for Guantanamo Bay to be shut down as soon as possible. [A timetable for withdrawal from Iraq might be a temptation for Mr Brown but this would be a safer way of distancing the new Prime Minister from America without undermining the Iraqi government]. "I think there are a lot of potential benefits from road pricing but I want to lead a Government that genuinely listens to people. That's why I'm writing to you to say that there will be no national road pricing scheme for ten years. Thank you for signing the petition and I hope you will use other petitions on the Downing Street website to communicate what you want from my Government. It won't always be possible for me to agree to what you want but I will always pay close attention to what you say." The pollsters on polling: In this era of constant electioneering do governments still recover from the mid-term onwards? Yesterday we revelled the answer to the first question: Blair is still in office. The public have yet to see Brown in Downing Street. Then there's the silly and party conference seasons. When will be a good time to start taking the headline polls seriously again? You can see the answers our experts gave here. Our second question is: The traditional view is that governments are most unpopular in the middle of their terms and their popularity generally increases closer to elections. In this era of constant electioneering does that historical pattern still hold true? Watch what our panel said below but here's a quick summary: Ben Page, yes it has, look at the last two Labour Governments, but you can't say it always will be; Andrew Hawkins yes it is true but every Parliament is different and Stephan Shakespeare says that in a time of constant electioneering we cannot always assume a party's popularity will return. At the time of writing Gordon Brown needs the backing of just one more MP to be certain of succeeding Tony Blair as Labour leader and our Prime Minister. The BBC asks if that is good or bad for him. My hunch is it's bad. He's not going to get the coverage a horse race contest would have generated nor will he be seen to crush the left and, in the process, style himself as the defender of Middle Britain. Update: It's now certain. John McDonnell has conceded and will be on Newsnight tonight. Are Tory members complacent or are they justified in their overwhelming view that Gordon Brown will be a less effective leader than Tony Blair? By sixteen-to-one (64% to 4%) those Tory members surveyed by ConservativeHome thought that the Chancellor would be a less effective leader than the outgoing Prime Minister. 24% believe that the Labour leadership election will keep the party in the headlines and give Gordon Brown an opinion poll boost but 70% do not believe that Gordon Brown will provide Labour with any long-term boost in the opinion polls. 38% think that the Labour leadership contest will be divisive and voters will see the old Labour left reasserting itself. 28% think that David Miliband should have challenged Gordon Brown for the Labour leadership. "David Miliband does not want to be the captain of a sinking ship. When Gordon Brown explodes or implodes, Miliband will step in as its saviour." "Gordon Brown will have no honeymoon at all. We will have a Callaghan-like three years with a failing Labour administration clinging on until the last moment." "There will not be a resurgence of the Left (as an identfied political force) for two decades, but its insidious influence (eg institutional egalitarianism and redistribution of rights) will remain." "The rump of 40-50 hard left MPs, all in safe seats, will be shown up as the potential power brokers in a Labour minority or coalition administration." "The Tories will see a dip in the polls because we won't have publicity... This will lead to plotting against DC, wasting our chance to consign Labour to opposition for a decade..."
"GB is not new; any bounce will be minimal; he is the co-architect of New Labour and cannot see why it has gone wrong." "There should be a general election, NOT an internal Labour party election, or automatic handover." "Gordon Brown has no mandate over English issues." Cameron's quiet today: "Tory leader David Cameron was unusually coy about his views of Gordon Brown as he visited a green waste recycling plant in his constituency." "Prime Minister-in-waiting Gordon Brown is seen as more arrogant and less in touch with voters then Tony Blair and Conservative leader David Cameron, according to a Newsnight poll. The Chancellor is expected to become the next premier, but appears to have an image problem with some of the electorate, the poll commissioned by the BBC current affairs programme suggests." "Was that it? After ten years of waiting, all Gordon Brown has given us is re-heated slogans and a promise to listen – when all the evidence shows he’s incapable of acknowledging his mistakes. The last ten years were the Blair/Brown years, so he cannot be the change Britain needs. It’s same old Labour, same old spin. That has become crystal clear today." "I've heard this somewhere before, I kept thinking. On one level this was hardly surprising. The speech was composed of bog standard political platitudes that could have come from any mainstream British politician. However, there was something about the precise choice and framing of the platitudes that was distinctive, and yet far from original. And then it came to me, another speech, delivered four years ago by none other than Iain Duncan Smith." "He’s also right to be very cautious about signing up to any new treaty. Many other EU leaders have failed to listen to the no votes in France and Holland, and they now plan to push ahead regardless and transfer significant new powers to the EU. Brown should certainly go to the key EU summit on 22 June to make sure Tony Blair doesn’t lock him into something which the voters don’t want." "Following Tony Blair’s announcement to leave office by 27 June 2007, but noting his promised attendance at a major European Council Summit on 21-22 June, The European Foundation demands that Gordon Brown must pressure Blair not to commit to the Constitutional Treaty before his departure or leave the UK position open to further EU obligations." Dizzy Thinks points out that GordonBrownForBritain.com has just gone live. It includes a voting facility on what policy areas he should be focusing on and a Google map of where he takes his campaign (rather similar to Where'sGordon?). Gordon Brown has just finished his launch speech and long Q&A session in the Imagination Gallery (the rest of his itinerary was revealed on ToryDiary yesterday). The room was crammed with journalists and Brownites and chaired by Jack Straw. 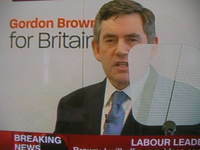 The event didn't go smoothly - one of the autocue screens blocked Brown's face from the camera for his whole speech. He twice muttered to Straw that he could take every question rather than just a few and was being extra nice to the journalists, it all seemed very false. To make it worse, Tony Blair competed for attention on the BBC's split screen by speaking at the simultaneous launch of a Sir Bobby Moore statue at Wembley. "When you look at the things people are really fed up with, like the collapse of the pension system, like the failure to get money to the frontline of the health service, Gordon Brown is more responsible for that than any other politician including Tony Blair." This post will be updated with news and commentary throughout the afternoon. Mr Brown's message: I am going to be Prime Minister for Middle England. short informal speech. Afterwards he's planning to go to Basildon's leisure centre at around 5pm. Do take some time off work to make him feel welcome. 11/05 afternoon update: Brown will be in Harlow at 4pm. "He is not a fresh start: he is the blast from the past." "Every imaginable aspect of the last 10 years of government has had to pass through Brown's all-controlling hands." "Brown is not just the perpetrator of spin and propaganda: he is their principal architect." "There isn't one of his budgets which has been free of deceitful trickery, and he cannot escape responsibility for a single day of the last 10 years." 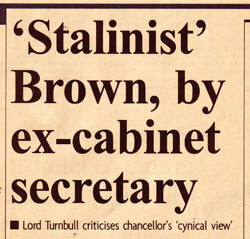 "In many areas of government, Brown has been more in charge than the Prime Minister himself. There is no way Brown will be able to dissociate himself from Labour's record - he is the record." "The man who destroyed your pension and doubled your council tax will soon have nobody else to blame but himself." Scroll down ToryDiary's Countdown to Brown? category for more on the man. Meanwhile, Jon Cruddas, now backed by Tony Robinson in the competitive Deputy Leadership race, has released a poll of Labour Party members showing that half of them believe the elections results last week were bad and that their party needs to change some policies and the way they operate. The FT has a crisp new look today and carries an article about the possible line-up of Gordon Brown's first team. The article follows yesterday's news that David Miliband will not be challenging Gordon Brown for the Labour leadership. Mr Miliband's reward, speculates the FT's James Blitz, might be the office of Foreign Secretary although Mrs Beckett has only been in the job for one year. Mr Blitz expects John Reid to stay in place. There has been a thaw in relations between Brown and Reid in recent months and there is little sense in introducing new instability into a department that desperately needs some continuity of strategic leadership. The most interesting decision for Mr Brown will be the appointment of his own successor. Alistair Darling has been the long-term favourite but there is now some concern that having three Scots in the top four jobs in British government won't exactly help the Labour Party with its English problem. Mr Darling might be passed over as a consequence and Ed Balls or Jack Straw might become Chancellor of the Exchequer. Jack Straw, Brown's campaign manager, would then have held all three main offices of government outside of the very top job. The FT says that the City would probably welcome Ed Balls as Chancellor. Blitz also expects some big promotions for young turks Yvette Cooper, Andy Burnham, James Purnell and Ed Miliband in order to suggest that a Brown administration will have vitality. This resuffle speculation follows last week's blogtalk that the Tories might play musical chairs themselves. Dizzy speculated that Liam Fox might be moved. 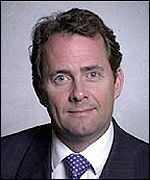 That would be a very risky move as Dr Fox is the champion of the right within the shadow cabinet and his emphasis on energy security represents an alternative way of selling David Cameron's climate change agenda to people who are sceptical of the state's ability to combat global warming. First Gordon Brown ignored the advice of civil servants and embarked upon his devastating raid on the nation's pensions. Now we learn from The Sunday Times that he ignored the advice of the Bank of England when, from 1999 to 2002, he sold much of the nation's gold reserve. His pig-headedness cost the nation an estimated £2bn. Hardly a day goes by at the moment without a damaging headline about Gordon Brown. This website isn't complaining - oh no - but it is interesting that stories that previously couldn't be sold to newspapers are suddenly getting splashed across front pages - day after day after day. Both the pensions and gold sale stories are not new stories. The Tories have been trying to get the nation angered at them on many previous occasions. What has changed is that the media are now in herd-like pursuit of Brown. Probably because they want a leadership contest. "80% of the size of a story depends upon the mood of the journalistic pack and 20% on the intrinsic importance of the underlying news event." Or perhaps it should be 90% to 10%? A minimum 60% cut in carbon emmissions by 2050. "Housing is not, or should not be, a status symbol, an object of conspicuous consumption, or a source of market power or wealth. It is a place where individuals and families should be able to live and inter-relate in mutual happiness. Too many people have second homes or too large homes for their needs, while too many others are homeless or overcrowded or even lacking basic facilities." Blair - our deadliest-ever political opponent - has confused the electoral landscape for more than fifteen years. The end of his time in Number Ten will be a huge opportunity for Conservatives if Old Labour views come to prominence during the leadership election. Labour still do not appreciate how central he was to their success. Iain Dale has more on the increasingly negative race for the Deputy Labour Leadership. These are bad times for Gordon Brown. Opinion polls suggest that David Cameron's lead will grow as soon as he succeeds Tony Blair, his Budget flopped with voters, his nose excavation habits have become a pick of YouTube (thanks to Guido) and his former Cabinet colleague Charles Clarke is desperately organising a leadership challenge to him. Arrogant: Gordon always knows best (or at least he thinks he does). His Cabinet colleagues have long complained about his arrogance. His former top civil servant compared him to Stalin two weeks ago. Because of his waving away of civil service warnings on the pensions crisis we now know that arrogance is not something he has learnt in office but a fault from the very beginning of his time in Government. Short-termist: For a short-term revenue windfall Gordon Brown did long-term damage to Britain's pensions sector. The same can be said of the complicated tax system that he has created. The sly and stealthy taxes have brought extra money into the Treasury in the short-term but at the long-term expense of Britain's competitiveness. Sly: The civil service advice was released at the end of the parliamentary session - leading opposition politicians to claim that he was trying to hide the bad news. The news would probably have been forced out by Freedom of Information requests but Brown may have acted now in order to 'bury the bad news' before the leadership contest gets underway. Brownites would like us to believe that the era of spin will end when their man replaces Tony Blair as Prime Minister but Mr Brown has been as guilty of New Labour's defining weakness as his long-time neighbour. Every one of his Budgets has hidden the bad news. This year's Budget was no exception. A 2p cut in income tax was proclaimed but lots of stealthy tax rises were only discovered in the days that followed. 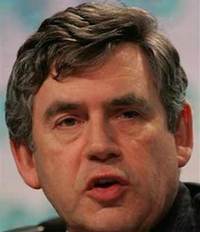 Unrepentant: Gordon Brown won't ever admit when he's wrong. Although his pensions raid was clearly the wrong thing to have done he still won't admit it. "A stealth tax aimed to hit those who have worked hard and saved for their future was pushed through, and then, when the full scale of his failure is finally revealed, there is not a hint of an apology," notes George Osborne in today's Mail. Brown is also unrepentant about the complex maze of benefits and tax credits that he has created and the persistence of poverty despite massive and wasteful expenditure. Some leading labour modernisers are desperate for an alternative successor to Tony Blair to emerge but the supertanker that is the Labour party seems unable to engineer a change of course. After years and years of Tory leadership crises its fun to watch Labour enjoying one of their own. "Gordon Brown’s betrayal of pensioners in the 1997 budget was carried out not only against Civil Service advice but even against the will of the Prime Minister. "This revelation today shows that if it hadn’t been for Tony Blair’s insistence on watering down Gordon Brown’s tax raid, the damage would have been even worse than the £100 billion hit that pensions funds have already suffered." As today's YouGov poll shows - Wednesday's Budget has not fooled the British people. The Conservative lead is higher since Gordon Brown got to his feet than it was before. Wednesday's Budget has done nothing to alter the course of the British economy or the growth of the British state. Under Gordon Brown, Britain has become a much more European-style economy with high levels of tax and spending and with a huge increase in dependency. If only we had an Opposition willing to deliver a fundamental change of course (but that's a topic for another day). The 2007 Budget did nothing to repair the damage that Gordon Brown has done to UKplc. But it did - hopefully once-and-for-all - prove that the Chancellor is every bit as manipulative as Tony Blair. This was a Budget where all the tax rises were hidden and the tax goodies trumpeted. "If people want to know what this Chancellor would be like in No. 10, they should look no further than yesterday’s Budget—stealthy, sneaky and unable to tell the truth. He is not the man who can restore public trust in Government, because he is the reason why people do not believe a word that they say any more." It is a lasting legacy of the New Labour project - a project that we must never tire of describing as the Brown-Blair project - that hardly anyone believes a word from any politician. One challenge for Mr Osborne is to devise a new way of handling the whole Budget process so that it is transparent and that announcements will become more believable. Where is the 'Stop Brown' blog campaign? Last night we learnt that David Cameron would enjoy a notional lead of 15% if Gordon Brown was Labour leader. If that didn't upset the Chancellor this morning's FT must really have got him worked up. Lord Turnbull, who was Mr Brown's Permanent Secretary at the Treasury for four years before becoming Cabinet Secretary, accuses the Chancellor of "Stalinist ruthlessness" and using his department to treat ministerial colleagues with "more or less complete contempt." According to the FT's Nicholas Timmins Mr Brown holds a “very cynical view of mankind and his colleagues”. “He cannot allow them any serious discussion about priorities. His view is that it is just not worth it and ‘they will get what I decide’. And that is a very insulting process,” Lord Turnbull said. This is not, of course, the first time that people who have worked closely with Gordon Brown have found his conduct wanting. A Downing Street insider (perhaps even Blair himself) once told Andrew Rawnsley that Mr Brown was psychologically-flawed and Charles Clarke launched an extraordinary attack on his Cabinet colleague after resigning last year. Labour MPs must surely now be considering the once-impossible thought that Gordon Brown is not the man to succeed Tony Blair. Unlike Iain Dale, I do not worry about David Miliband. Someone recently told me that Mr Miliband looked like the sort of boy who would be bullied in the school playground. I don't think he could best Cameron. If I were Labour I'd be very interested in the idea of John Denham. The idea - floated on PoliticalBetting.com a little while ago - may be Labour's last and best hope. Articulate, respected by colleagues, representing a southern seat, very knowledgeable about crime because of his Chairmanship of the Home Affairs Select Committee and only out of the Cabinet because of his decision to resign over the Iraq war, Mr Denham could be a credible opponent to Mr Brown. He would be a man much more likely to represent a breath of fresh air. Interesting times. 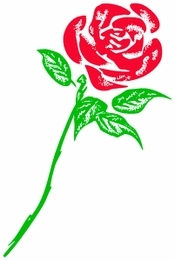 This is certainly the time for a powerful Labour blogging community to emerge. On Comment is free yesterday, Mike Ion argued that left-of-centre blogging was on the rise and could be a big factor in the deputy leadership race. My advice is this: the most powerful Labour blog will be the one that begins a Stop Brown campaign and now. The US left wouldn't have waited this long. Labour's grassroots shouldn't wait for Milburn and Clarke to act - they should begin a netroots movement now. Perhaps we Tories should be mounting a Save Brown campaign? Nigel Griffiths, Deputy Leader of the Commons, has resigned from the government over Trident, Jim Devine, PPS to the Health Minister, is expected to do the same later this week. Charles Clarke has fuelled infighting by urging David Miliband to stand for the Labour leadership, and deliberately not endorsing Brown. Sir Hayden Phillips appears to be standing firm on the principle of caps on individual donations, including those that come via trade unions. "Despite the opinion polls, it is hard to see how the Tories are going to win. Brown looks a good bet for the next election. He may not secure an overall majority, but he should survive in Downing Street." "Today’s Tory team lacks strength in depth. George Osborne is good but not yet weighty. David Davis is substantial, but is not part of Cameron’s project to transform the party. David Willetts and Oliver Letwin lack any sort of common touch. There is no Campbell or Mandelson. There is no Norman Tebbit either. The Conservatives have yet to find a person or a device to attract back the working-class voters who were an essential part of Thatcher’s winning coalition... The Tories are searching for some other idea that appeals to voters who aspire to do better for themselves: a modern equivalent of Thatcher’s policy of selling council houses to their tenants. But after years of thinking, no good idea has come to the Tory mind." "If I were the chancellor, I would fear the economy more than the Tories. The downturn in the United States, led by falling house prices, is ominous. Now that is really significant, because economic weather regularly moves across the Atlantic. Maybe we can forecast, after all, that June 2010 will be dark and squally." Michael Portillo might be right to worry about the US economy but there is no automatic guarantee that the Tories will be trusted to lead Britain out of a recession. Although the Tories are - according to some polling - more trusted on the economy than Labour it is a result of a fall in support for Brown; not a rise in confidence in George Osborne's team. A recession may give Brown the opportunity to persuade the electorate that this is not a time to take risks with an untried economic team: hold on to nurse for fear of something worse.